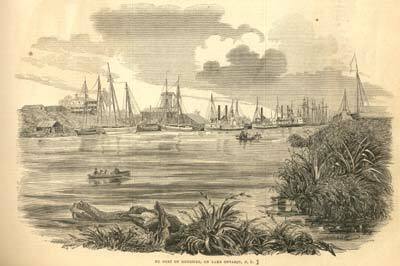 Woodcut engraving of the Port of Genesse, on Lake Ontario, N.Y. from an ambrotype by E. T. Whitney of Rochester. The principal steamboats are, from left to right, the MAPLE LEAF, HIGHLANDER and ONTARIO. The original ambrotype is featured in Gerald T. Girvin, "The Maple Leaf Story Prior to the Civil War", in Keith V. Holland et al., eds., The Maple Leaf: An Extraordinary American Civil War Shipwreck , (Jacksonville, FA: St. Johns Archaeological Expeditions, Inc., 1993), p. 64.